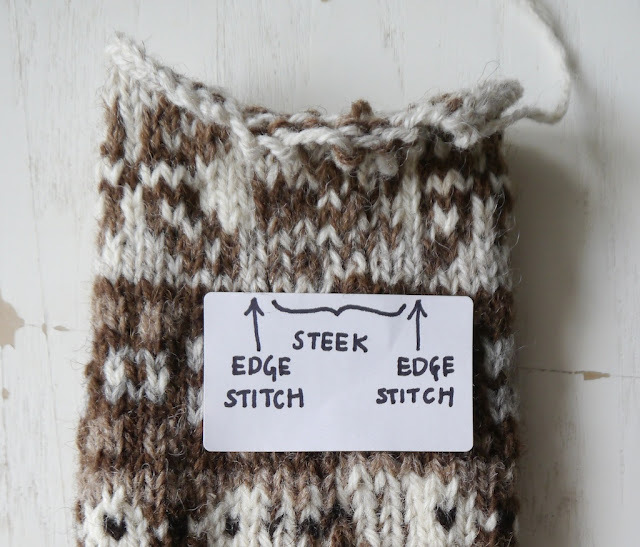 First of all, the pattern calls for six steek sts. In addition, you will also need some stitches to pick up from: these are called the edge stitches. So apart from the pattern stitches for the cardigan body, there are two edge stitches, and six steek stitches. The steek stitches are knitted with both colours held together as one. 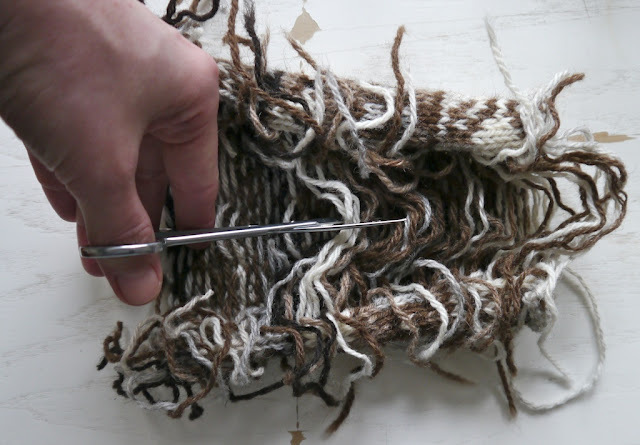 When it’s time to cast off, only cast off the edge stitches and the pattern stitches. 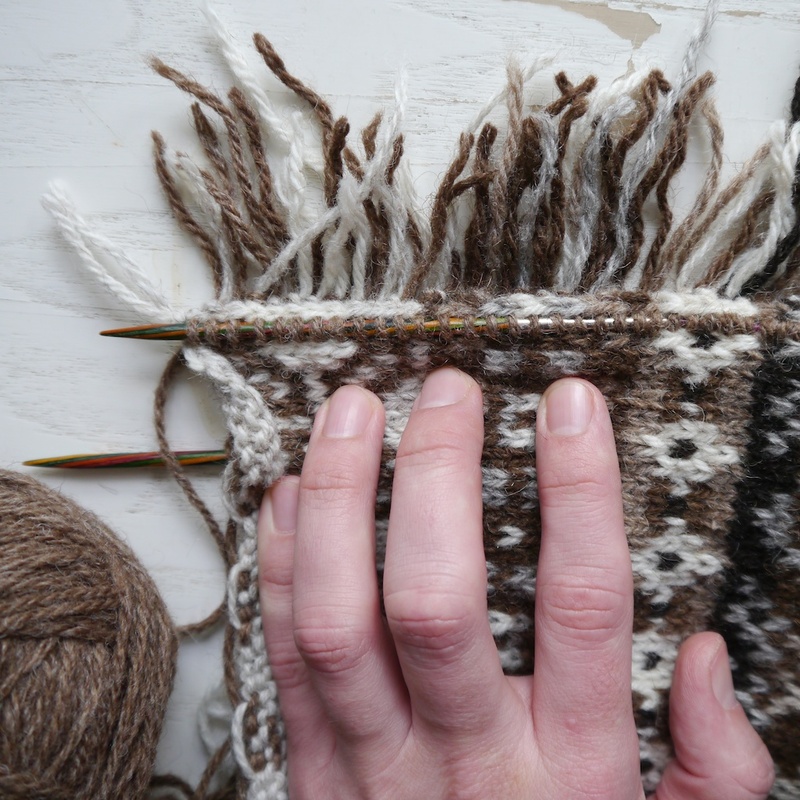 The steek stitches will not be cast off. It’s now time to pick up your stitches. 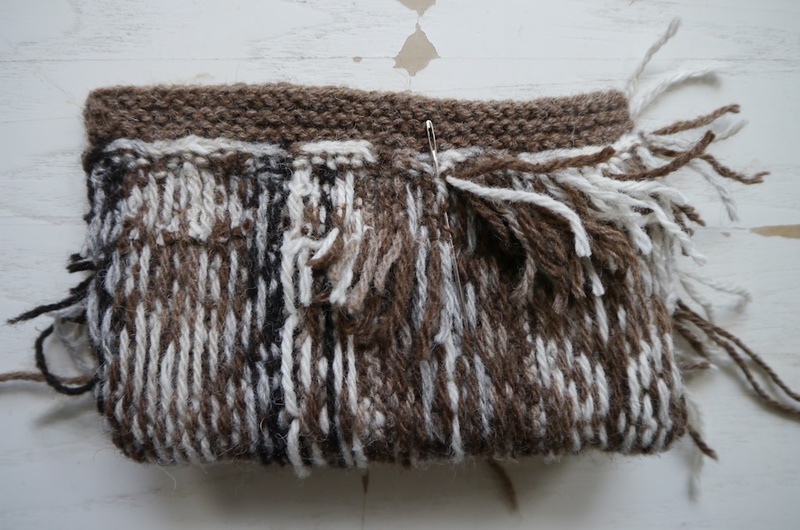 You pick up between the edge stitch and the first pattern stitch. 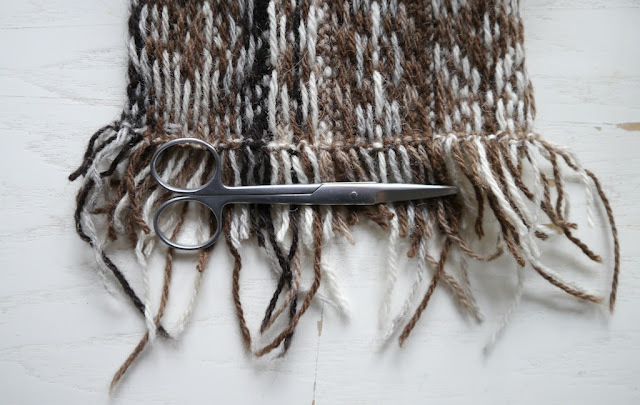 Keep an eye out for the fringe, and try not to trap them with the yarn you are using for picking up. Now commence knitting the buttonbands or sleeves. This is the part that will take a bit of time. Perhaps because I love darning so much, I really enjoy it. Be prepared to set aside an afternoon, and make a cup of tea before beginning. You will soon find yourself getting into the rhythm and becoming absorbed by the task at hand. You will need a sharp wool needle with a large eye. Sometimes called yarn darners, they are basically a chunky version of a crewel needle. The ends are darned in on the wrong side by skimming the floats at the back. If you find the strands a bit on the short side, then employ a classic sewer’s hand-finishing technique: first darn in the needle, and only then thread the needle; I use the method explained in this blog post by Stitchers Needle. 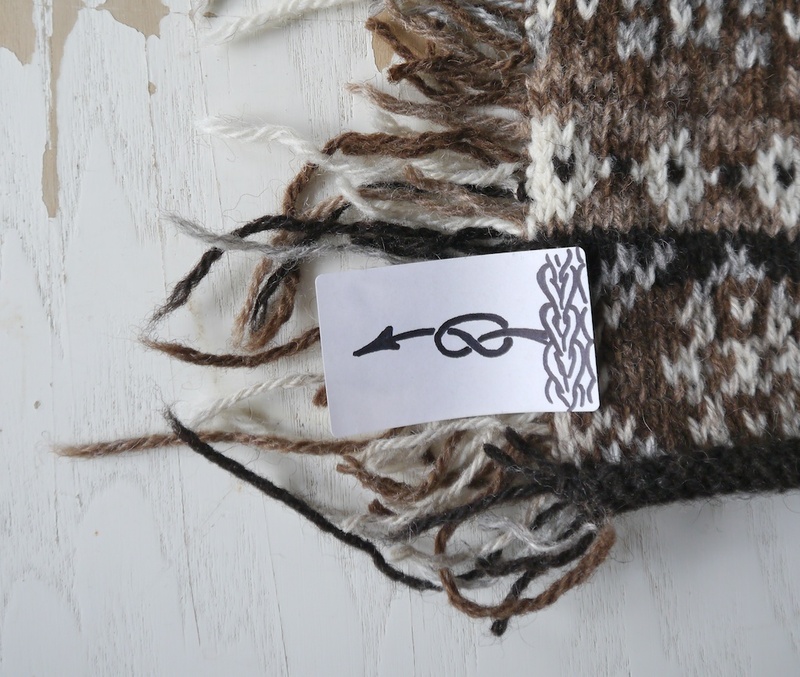 By threading the needle with the two yarn ends from one knot it will go quicker than you think. Once the fringe has been darned in, trim the loose ends close to the surface. 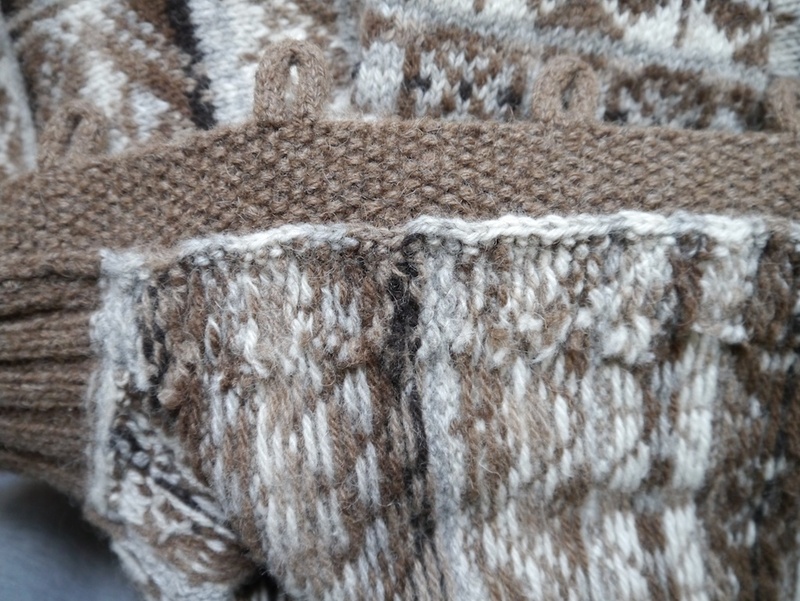 There you have it, a steek which is virtually without any bulk, and which doesn’t impact the stretch of knitted fabric. Over time, this finish will become neigh on invisible.